According Krishna Byre Gowda (Agriculture Minister, Karnataka), 70% of agriculture in the Indian state of Kartaka is directly dependent on rainfall. A small portion of the agriculture takes place in high rainfall areas where irrigation is less of a concern. The majority of agriculture takes place in areas which get a paltry 500 to 850 mm of rain annually. The low levels of rainfall are aggravated by erratic timing. In addition, there is a mismatch in timing between needs of the crop and actual rainfall. This uncertainty and low rainfall make rainfed agriculture structurally weak, even though the amount of total annual rainfall may actually be adequate to get one or two crops. Unfortunately, much of the rain water runs off the fields and is, in effect, lost. 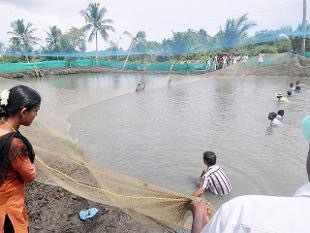 Karnataka farmers are experimenting with a new initiative - conserving rain water in ponds on farms. The idea is to store the runoff rainwater in a pond in farmer's field and reuse the water to save crops during dry spells when the crops would otherwise wilt or suffer severe damage. This not only helps farmers get their crops but substantially boosts yields by ensuring timely irrigation. The incomes of farming communities increase and they are able to become more sustainable. The Karnataka program of 'farm ponds' requires participating farms to set up drip or sprinkler irrigation systems. Farmers also have the option of setting up greenhouses with drip irrigation to grow 'high value' fruits and vegetables and thus increase farm incomes. This program builds on successful pilot projects run by the nonprofit Deshpande Foundation in northern Karnataka.